If you have a tattoo or are contemplating getting one, certain body changes should be taken into consideration, as they may affect your ink. One of the most dramatic changes is the effect on tattoos after weight loss or gain, including muscle gain from strength training and weight gain from pregnancy. This article explores different types of body changes and how they may affect your current or future artwork, either temporarily or permanently. In most cases, even dramatic weight loss only shrinks body parts a small amount. So depending on how much weight you lose, it may or may not affect your ink. That is, of course, unless the tattoo is extremely detailed. Lines drawn close together could theoretically blend after weight loss, causing a distorted image. But this is a rare occurrence. 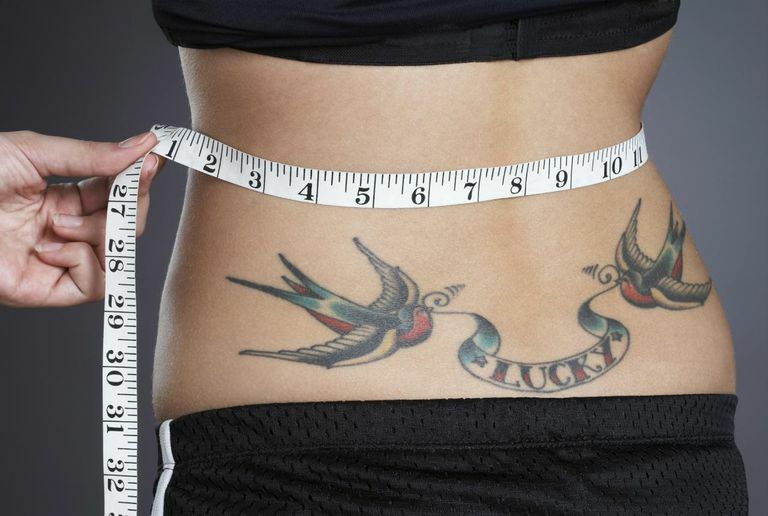 If anything, tattoos after weight loss often look better. One possible exception to this rule is drastic weight loss over a short period of time—either from surgery or illness—which can result in sagging skin. If the tattoo resides on top of the sagging skin, the tattoo itself can look distorted. While dramatic weight gain is certainly not encouraged, it happens to the best of us. The good news is—similar to weight loss—even significant weight gain causes only minimal changes in each body area. However, the stretch marks associated with weight gain can ruin your ink. The deeper the stretch marks, the worse the damage—and it's irreversible. Only tattoos located directly in the body's midsection are susceptible to damage due to pregnancy weight gain. This is why women are encouraged to wait until after their childbearing years before deciding to get a tattoo in this area. Because the weight gain and skin stretching are so dramatic in pregnancy and happen over such a short period of time, even if you don’t get stretch marks, the tattoo probably won’t fare well. And stretch marks will only make it worse. Working out and toning your muscles shouldn’t affect your tattoo at all. But if heavy weightlifting is your thing, significant muscle gain could cause some problems. The better the placement of the tattoo in relationship to the muscle, the less chance of image distortion due to muscle bulge. For best results, achieve your optimum muscle mass first, before getting a tattoo. Just be careful about working out while it's healing. If you don’t have a tattoo already but are considering getting one, you might want to ponder the chance of future body changes. Losing weight, gaining muscle, or becoming pregnant can all affect the look of your tattoo, depending on its location. Going for it now, or waiting until later, is something only you can decide. Or get your tattoo in an area of your body that won’t be affected. Whatever you decide, just remember—in rare instances, damage to a tattoo can occur from things we have absolutely no control over.